There are many things I have regretted not doing. A recent one was not eating a typical regional meal while in Rome. I don’t remember why…was it, because this was the last city of the WTT tour, I was getting exhausted of Italian food? 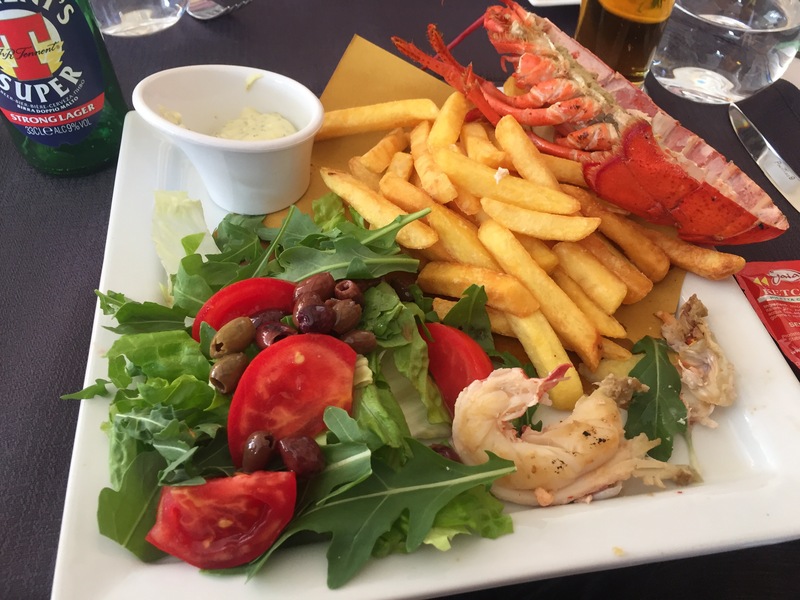 (No, that’s not it) Or, was I really attracted to the lunch lobster platter at Royal Art Cafe, where I saw two guys outside enjoy a big lobster tail with fries, right outside the Colosseum? (Yes, that’s exactly right. I was temped by cute boys and historical monuments.) And, this was my last big meal with the group, so I needed to get lobster while they were able to pay for it! I did pay for the beer, a very strong British-brewed lager. Carmen, who sat next by me, ordered the same thing. The lobster tail was, only just okay. Surprisingly, it was the only meal in Italy that was “just okay”. They did a good job on the French fries: they were golden and crispy. Now, since I’m back in the States, why didn’t I try the Cacio e Pepe when in Rome? Or the spaghetti Carbonara? Cacio de Pepe literally means “Cheese and black pepper”. Romans have a curious love affair with peppers; Cacio e Pepe pasta is full of whole black peppercorns, swimming in fresh melted and unmelted Parmesan cheese. 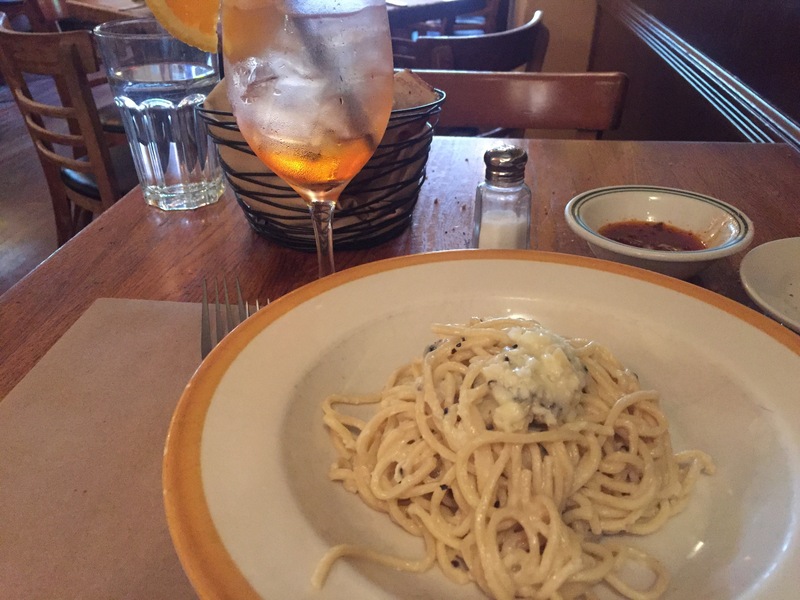 I ordered a Aperol spritzer at Cacio de Pepe, a place serving Roman cuisine, and, according to a Google search, it’s one of the best places in New York City to order, guess what, some Cacio e Pepe. The waiter, who I can guess was once a native Italian (and he was very easy on the eyes, God help me), seemed pretty impressed. “Of course. That’s what people come here for,” he smiled. Well, people must come for miles around, because the dish I had was beyond fantastic! It was the Tonnarelli Cacio e Pepe: homemade pasta mixed in a hollowed-Parmesan cheese rind bowl, which mixed the cheese effortlessly with the hot pasta, and a generous heaping of black peppercorns. The bread was served with a sun-dried tomato tapenade with a bit of pepper in the oil. It was simply Devine. I felt I was in Italy again; my mouth and taste buds were so happy, and the spritzer (with a huge orange garnish!) was delicious. I miss Italy, yes, but not as much as my mouth. Since I’ve been back, everything I taste tastes like crap.